I love trying out new recipes! Usually, I follow the directions the first time then tweak it to my liking thereafter…This one, however, I just made up. And boy, is it tasty! 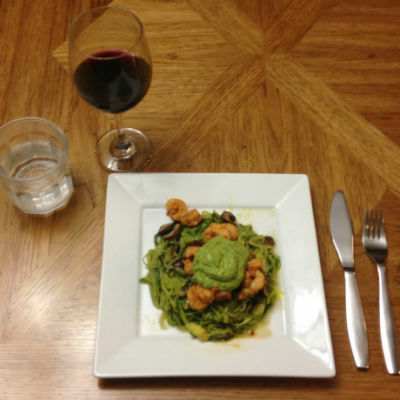 In less than 20 minutes, you will have a gourmet, healthy, and delicious shrimp dinner ready to enjoy. Avocados are full of fiber, nutrients, and healthy fats that support the integrity of every cell in the body — most visibly contributing to soft, supple skin and hair. Basil is a power herb known for it’s anti-inflammatory, anti-aging, and antioxidant properties. Zucchini is full of vitamins and minerals like B1, B6, and B2 plus magnesium, calcium, potassium, and many others that aid in energy production and tissue hydration. Shrimp is low-calorie, high protein, and rich in vitamin D, which aids the uptake of vital minerals like calcium and phosphorus. 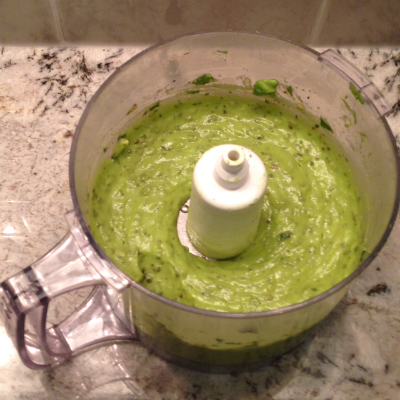 Blend all ingredients for the sauce in a food processor or small blender until smooth. Season with extra salt and pepper to taste. 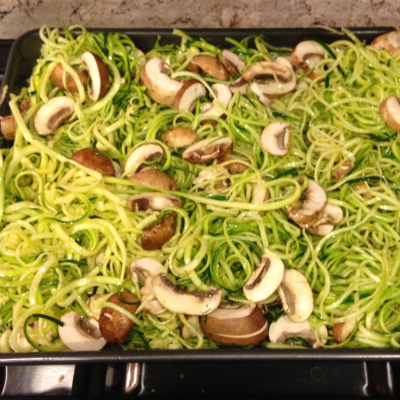 Place zucchini noodles and mushrooms in a large glass baking dish. Drizzle with 3 tablespoons olive oil and season with ½ teaspoon sea salt and ½ teaspoon black pepper. Toss well to coat. Roast vegetables for 20-30 minutes, checking & tossing every 10 minutes until desired degree of doneness. While veggies roast, prepare the shrimp. In a medium bowl, combine remaining 1 tablespoon olive oil, lime juice, ½ teaspoon sea salt and 1-2 teaspoons chili powder. Add shrimp and toss to coat well. Bring a large skillet to high heat. Add shrimp cooking about 2 minutes per side or until no longer pink. 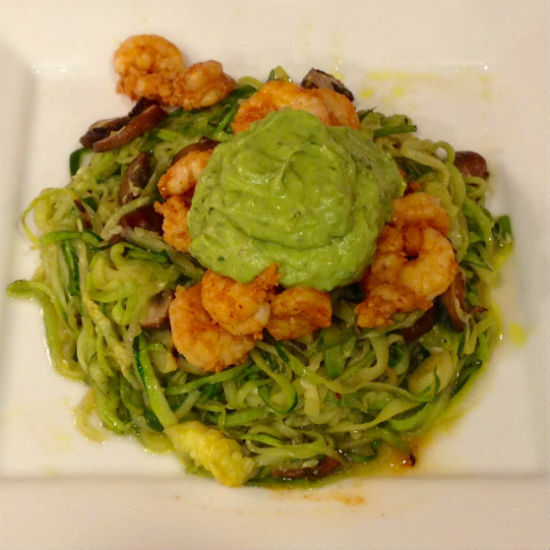 Serve the veggies topped with Avocado Basil Sauce and Chile-Lime Shrimp.